The corporate, law enforcement and military infrastructure in play against him has virtually unlimited resources, little to no accountability, twisted, vengeful tactics and a very long memory. With his extradition hearing presently unfolding in an Auckland Court, it is a critical moment for Kim Dotcom, his co-defendants and their families. But the mechanics of the lawsuit and extradition process are just a drop in the bucket of what has been inflicted upon them. The real story isn’t about a prosecution at all. It is about illegal surveillance, slashed tyres, dead pets, electoral sabotage, infiltration, suspicious car accidents and a drive-by shooting. The very existence of the respective intelligence agencies remained secret for years and was only ever (eventually) confirmed due to public inquiries and investigative journalism. In more recent years, the UK/USA Agreement was further enhanced by a string of post-9/11 “War on Terror” counter-terrorism and ‘intelligence sharing agreements’. In the light of Edward Snowden’s revelations of secret NSA facilities in New Zealand, it is common knowledge that the country has effectively become a client state of the USA. A political and economic Mini-Me replete with fracking and GMO‘s. Run by a banker – an ex Member of the United States Federal Reserve who was also Minister in charge of the intelligence agency caught illegally spying on its own citizens – the GCSB. As with the rest of the Five Eyes, New Zealand is a country where under-regulated private investigation and security interests work hand-in-hand alongside the state intelligence agencies. For those agencies, increasing the pool of targets has a monetary gain attached to it, in these days of state surveillance turning a profit. Stalking Kiwis on the basis of political belief or association is a commercial enterprise. A well-funded and well-armed industry. The East Stasi tactics of the past, as memorialised by a museum in Berlin, Germany, are a short-list of what is in play against dissidents in the Five Eyes countries. Each time spy agencies are caught out red-handed, they pass a law to retrospectively legalise their illegal activities, then continue them unabated. We have police filing thousands of warrantless data requests to companies which then hand over the private data of citizens without true legal compulsion. Intelligence agencies openly filming Kiwis and their families, inside their own homes, Orwell-style. 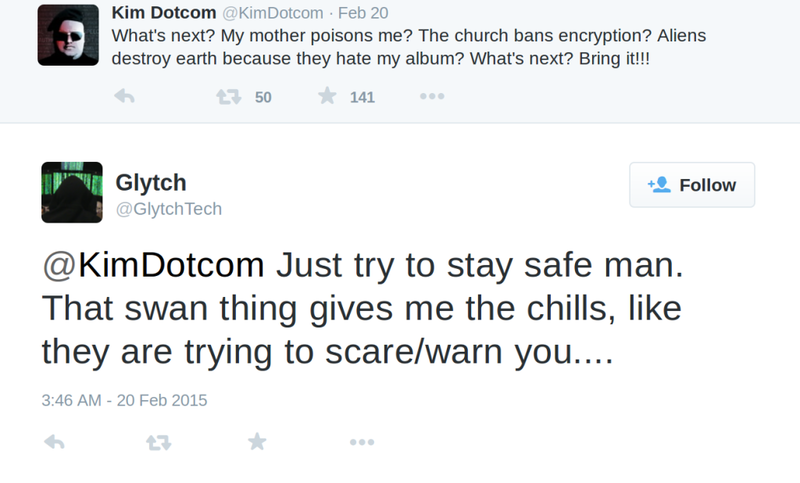 This is the environment in which the litigation against Kim Dotcom and co is unfolding. The children of capitalism are taught that anyone can become a millionaire. If you are clever, apply yourself and take risks, you could one day make the rich list. But this is extremely deceptive and misleading because the millionaires club is full of bullies with a pedigree and/or government connections. Once a person reaches a certain level of business success, raising their head above the parapet, gaining a profile, the powers that be hand-select who will be allowed to take the next step up, or who will have the full weight of the state thrown at them and be ruined. Billionaires don’t become billionaires under their own steam. They are pre-selected, accepted or rejected by the system. Millionaires who don’t directly serve capital interests, or who disrupt them, are not allowed to remain millionaires, or become billionaires. Thus, old money corrals and controls new money. If you don’t play the game, you will never be passed the ball. You will instead be red-carded and/or blacklisted. This kind of economic bullying is used against entire countries in the form of “economic sanctions“. When used against individuals, it takes the form of character assassination, malicious commercial interference and/or persecution by Financial Crimes Agencies operating under the “Anti-Money Laundering and Countering Financing of Terrorism Act 2009” legislation, as have been investigating Kim Dotcom. The same police investigation team was used to investigate the Urewera activists in the Operation 8 “terrorism” debacle. The case against Dotcom has not only been fraught with illegal spying but with other anomalies and examples of puzzling ineptitude on the part of the Crown. This year, a lead Inspector in the investigations, Grant Wormald, was found not guilty of perjury. The tactics of oppression being utilised – which are literally a Global War on Terror counterinsurgency strategy that can be and has been academically studied – actually fuels dissent. The persecuted only grow more determined and the protests grow bigger and more frequent with every injustice inflicted. In New Zealand and Europe, this is most visibly seen with the mass movements against the TPPA and against the TTIP respectively. In America, it has been most pronounced in the mass civil unrest and police curfews of Ferguson and Baltimore. The groans of public pain and insistence have become so loud that occasionally people have seized back the media narratives as, in alternately blacking out and distorting information related to the public interest, major media outlets have stretched their credibility to breaking point. In New Zealand the movements have come in waves, each bigger than the last. The intensive state targeting of political dissidents, while forever altering individual lives, has failed in stemming the tide of anti-government sentiment and public derision for John Key’s government is now widespread, even amongst its own traditional support base. Thanks to the duplicity and maliciousness of corporate media towards the entire political left, in particular, the Mana Party and the Internet Party, I was the only journalist granted a video interview with Hone Harawira at the Mana Party Annual General Meeting where the alliance with Dotcom’s Internet Party was announced. Our media team had made a name for ourselves producing unedited, unmanipulated, raw, live footage. In doing so, we provided people with what they couldn’t get out of mainstream media: unadulterated truth. Those we interviewed appreciated the fact that they wouldn’t be misquoted, spliced, edited or misrepresented. A Mandela confidante and indigenous leader, Harawira quoted Malcolm X straight into my camera. The following day, I was the only journalist granted a video interview with Kim Dotcom at his Mansion for the Internet Party #SwimWithKim event. Media ignored the actual content of Kim’s speech at the event, where he referenced the technological savvy the Internet Party employed; from being the first political party to allow sign-ups via mobile app, to their crowd-sourced Loomio policy platform and their internet-generation candidates. Where the paid media flailed at their lost access and printed conjecture-laden hit pieces, unpaid independent media and citizen journalists discussed the real issues. We created an elaborate mosaic of pics, vids and commentary to memorialise the events. As I reported previously, corporate media were far comfier with fireworks and super-yachts. Where tabloid angles didn’t exist, they were manufactured. I took this picture of Kim Dotcom, Chris Yong and Miriam Pierard for Occupy NZ, at the Internet Party #PartyParty event on Auckland’s famous K’Road. A picture that was then misappropriated by Rachel Glucina and published unaccredited in a poorly-executed smear of Pierard in the New Zealand Herald. I was the only journalist to get a video interview (with then Internet Party Leader Laila Harre) at the tumultuous press conference that immediately followed the ‘Moment of Truth‘ event. A press conference where the New Zealand media refused to ask Glenn Greenwald about the content of the revelations or his Pulitzer Prize-winning journalism, completely ignoring the Snowden revelations about NSA bases on New Zealand soil and XKeyscore being used against New Zealanders, instead obsessively honing in on attacking Kim Dotcom. Much has been written about the media’s malicious vendettas – at length by Nicky Hager in Dirty Politics, and in shorter form by Giovanni Tiso and Mandy Hager. The issues are complex, unresolved and involve a large cast of characters – an insidious web of political interference in media. To say that I am uniquely placed to comment on the topic of extra-judicial punishment would be an understatement. A barrage of it was imposed upon me ostensibly for my post FBI-raid interest in, coverage of and satellite involvement in the Dotcom saga and it is a part of why I am now effectively exiled in Berlin. The list of economic, psychological and physical assaults on me is a long one and similar to some of what has been endured by the central figures in the Dotcom saga. In my interview with Hone the shakiness in my voice is very apparent. The quality of my voice is a cross between intense anxiety and a dogged determination to steel myself and continue forward stoically. What isn’t so visible are the reasons why I was proverbially crapping myself: I was wholly aware of the historical importance of the footage I was capturing and aware that I and others would continue to pay a high personal price for doing so. As a result of my journalism, my house had been repeatedly broken into, my car tyres had been slashed, my family’s personal details and photographs of my home and vehicle published on the internet along with false accusations of me being a police officer. (Had I been a police officer the material would have been removed immediately; because I am not, and am in fact a target, the Police refused to get it removed and the completely false claims remained online for years). I was harrassed at home, at events, by email, by phone and on Facebook. I had been followed on foot, tailed by vehicles, stalked and repeatedly photographed by strangers. My mail had been tampered with and my telecommunications intercepted. As if that wasn’t creepy enough – things were about to get even more crazy in the lead-up to the 2014 general election and beyond. Here’s a partial timeline. April 12 & 13, 2014: Hone Harawira spurns mainstream media and quotes Malcolm X to my camera, Kim speaks with me. April 26, 2014: While holidaying in a remote location with my children, the oil cap was removed from our vehicle overnight by persons unknown, resulting in oil spilling all over the engine, catching fire and burning, stranding us. May 11, 2014: The children and I are returning from Northland when we are boxed in by multiple unknown vehicles and “dazzlers” are used to attempt to cause us to cross the center-line/drive off the cliff in a blind spot of a cellular deadzone in Dome Valley, north of Auckland. It is Mother’s Day. May 12, 2014: I call journalist Andrea Vance and report the attempt on my life. The Department of Immigration, meanwhile, is busy issuing deportation notices to Dotcom’s children’s nannies. May 17, 2014: Kim and Mona Dotcom announce their separation. June 25, 2014: Hone Harawira’s electorate office is the site of a drive-by shooting. The media takes nearly a week to report on it. Although Harawira is a sitting Member of Parliament at the time, very little is said about it in the mainstream media. August, 2014: Hone Harawira’s car is driven off a cliff in a cellular deadzone in Northland. Details are sparse, other than that he is no longer present at the scene when police arrive. Given their past conduct towards him, and that he likely would have had no cellphone communications at the location, that is hardly surprising. 14 September 2014: In the week leading up to the Kim Dotcom/Glenn Greenwald/Julian Assange/Edward Snowden ‘Moment of Truth’ event, the constant intrusion of physical surveillance on me especially while I was circulating the event media resources got so intensive that I took refuge at a friend’s house and somehow kept it together enough to record this live radio segment a day ahead of the event. 20 September, 2014: in the wake of a media snow-job on Snowden’s revelations, coupled with low-voter turnout, the ruling government win re-election. The persecution of Kim Dotcom is to continue relentlessly. 22 September, 2014: Having received several death threats and relentless piggy-backing of my communications, I file numerous and ultimately largely fruitless official information act requests in an attempt to discover who is behind the threats. Valentines Day, 2015: One of Kim Dotcom’s pet swans is killed. …is that Dotcom wins at the Supreme Court resoundingly enough for his persecutors to have to leave him alone and/or pay costs. It seems this largely depends on the degree to which the Courts value the sovereignty of New Zealand and remain free of corruption. Whether Court orders that go against their interests hold weight with and would be enforced or respected by the partially-privatised military industrial complex is another thing entirely. They may continue to do what they damn well please regardless of whether Kim Dotcom is ultimately found ‘guilty’ or ‘not guilty’. If someone(s) can continue to make money off stalking and surveilling Dotcom and anyone else within two degrees of separation of him then that is highly likely to continue regardless of any court outcome. Unless the cumulative geopolitic, financial and socio-political cost of them doing so becomes too great however, and some form of amnesty if not asylum is granted him. Certainly, few in New Zealand can outproduce Kim in the tech space, both in innovation and organisational ability. FVEY despise him because he is viewed as competition by the corporations and because he is a wildcard. Unpredictable, experienced and resourceful. The Internet Revolution doesn’t fit their risk management strategy, after all. Unfortunately, the Kiwi public are the losers in the transaction, if we abide by domestic and international intelligence agencies who protect the interests of multi-national corporations, despite the fact that they threaten public access to future technologies and deprive the growth of the local tech sector. Like the intelligence agencies, the corporations have a total disregard for democracy. Political sway, influence and representation is merely an entry on the general ledger to them – business transactions. Politics after all is just one column of the structure of power and control outlined in the counterinsurgency theory – the others columns being economics and security. If the political column falls, the Empire still reigns. It is only when the base of the structure – information – turns against them, that all three columns are affected. Kim Dotcom said long ago that he believed a donation he had made to Wikileaks triggered the investigations into him. Julian Assange recently revealed that it is the same Eastern District Court of Alexandria, Virginia Prosecuting Attorney involved in the investigations into Assange, Edward Snowden and Kim Dotcom. According to this infographic, the grand jury investigation into Wikileaks and its supporters has now extended over five years. Given this wider context, it is clear that the vendetta against Kim Dotcom is about much, much more than copyright. The law that everyone attends Kim’s High Court hearing to debate at length is just one of the avenues that his oppressors use to hurt him. Whether he wins or loses the case may be irrelevant to their ultimate intent. The Court action was a method to deprive him of resources, to attempt to malign his character, divide his family and friends. But it is just one piece of the counterintelligence pie. It is pretty clear that this case isn’t about what it appears to be on the surface. 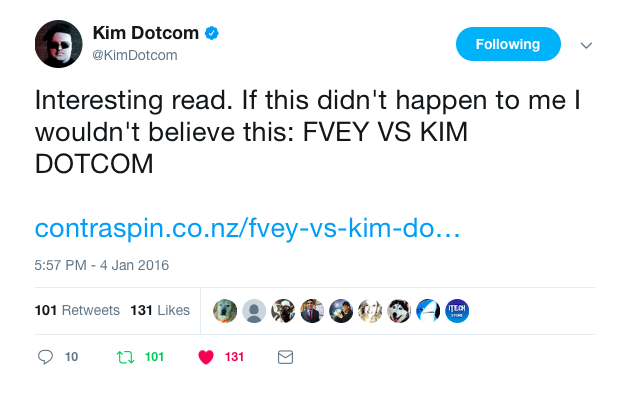 Instead, it is and has been for years, FVEY vs Kim Dotcom. It didn’t start in a Court room, isn’t always played out in one and regardless of the outcome, state interests and spies have long since judged Kim guilty and meted out their diverse and horrific punishments accordingly. With no small amount of collateral damage and blowback. [Update/January 2018] This post is now available at my Steemit blog. Very interesting. Thank-you for putting this together. It has helped to join more dots, which helps the truth prevail. People must say no to “smart” or “advanced” meters when the power company advises that a technician is visiting to install one. How did things come to this pass in New Zealand? RT @crockettoo_: How did things come to this pass in New Zealand?